Mon., June 27, 2011, 6:55 p.m.
Norma “Duffy” Lyon, whose life-size butter sculptures of cows, Elvis and even Jesus and his disciples delighted Iowa state fairgoers for nearly half a century, has died. She was 81. Lyon suffered a stroke at her rural home Sunday and died shortly after at a hospital, Michelle Juhl, one of Lyon’s nine children, said Monday. Known to most people as the “butter cow lady,” Lyon was pregnant with her seventh child when she produced her first bovine butter sculpture, a 600-pound cow, for the Iowa State Fair in 1959. The rural Toledo housewife went on to sculpt a butter cow every year until she retired in 2006, and along the way also sculpted the likes of Garth Brooks, a Harley-Davidson motorcycle, Smokey Bear and other images in her 40-degree refrigerated showcase at the fair. She picked up her penchant for sculpting while earning her veterinary science degree at Iowa State University and helping her husband with the family dairy and beef cattle operation. In the midst of her animal medicine and mammalian anatomy classes, Lyon took two sculpting classes. The Iowa State Fair has featured a butter cow every year since 1911 as a promotion for dairy products, and Lyon got her start after working briefly under her predecessor, Earl Dutt, whose work didn’t overly impress her. “It was a good farm cow, but it wasn’t a show cow,” Lyon told The Associated Press in 1999. 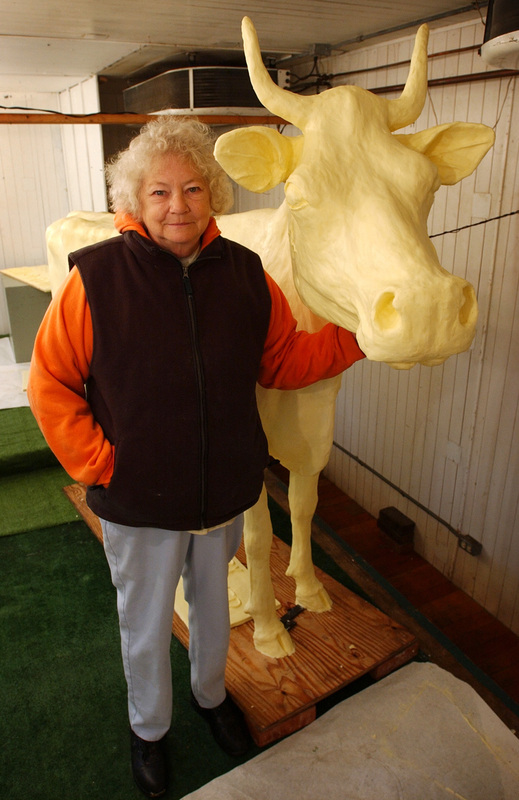 While Lyon wasn’t the genesis of the butter cow, she did expand the medium during her time as a butter sculptor for the state fair, much to the delight of fairgoers. She began carving companion pieces in 1984, starting with a horse and foal. In 1996, Lyon recreated Iowa artist Grant Woods’ “American Gothic,” the famous painting of a stern-faced man and woman with a pitchfork in front of a farm house. The following year, Lyon suffered a stroke, but recovered in time to sculpt the traditional cow and a 6-foot likeness of Elvis Presley that saw fairgoers lined up around the building that housed it. In 1999, Lyon took on what was arguably her most ambitious project: Her own rendition of the biblical story of the Last Supper, featuring disciples around a table leaning back on lounge chairs while Jesus stood at the head of the table with his arms stretched out, looking toward the heavens. Lyon also garnered attention in 2007, when she publicly backed Barack Obama for president and appeared in campaign ads for him. Juhl, who was 4 when her mother sculpted her first butter cow for the fair, doesn’t remember a time when her mother wasn’t the “butter cow lady.” But she does remember getting to travel to Des Moines for the fair. Lyon is survived by her husband, G. Joe Lyon, her nine children, 23 grandchildren and five great-grandchildren. Published: June 27, 2011, 6:55 p.m.